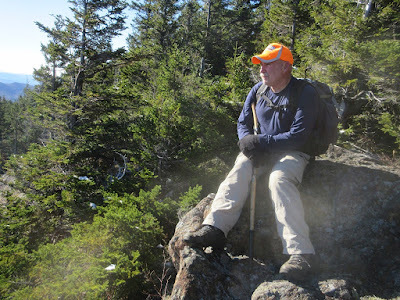 Owner of Mountain Wanderer Map and Book Store and avid hiker for 40 years. Editor of AMC White Mountain Guide and author or co-author of several other White Mountain guidebooks. Member of AMC Four Thousand Footer Committee and WMNF trail adopter. 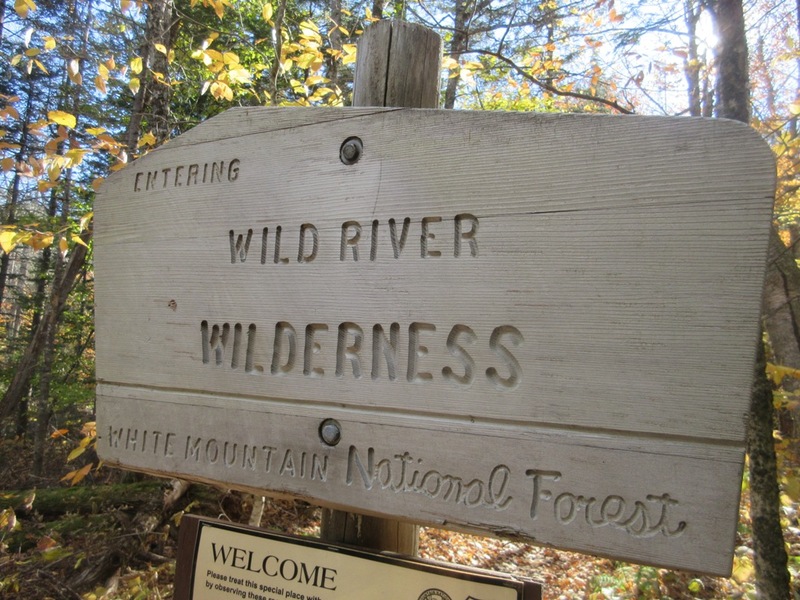 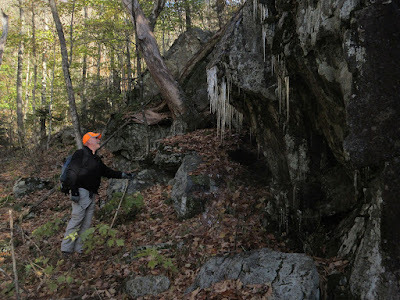 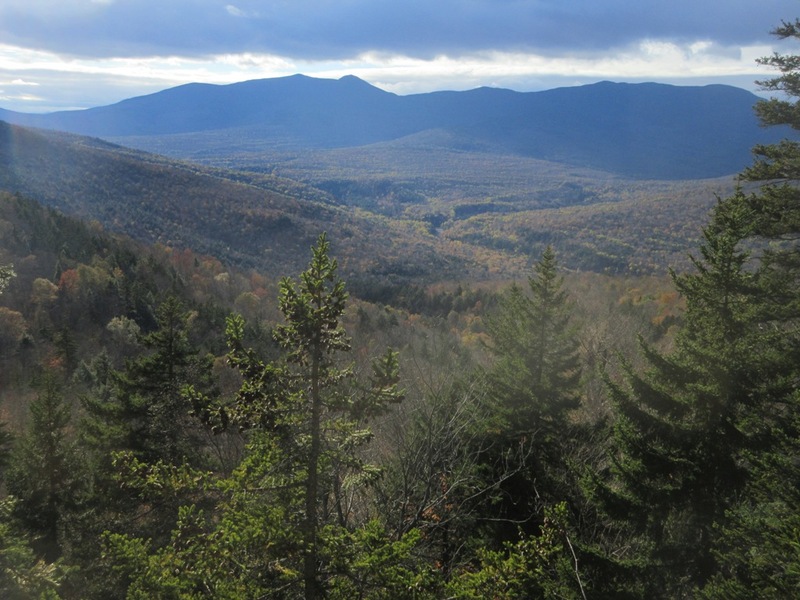 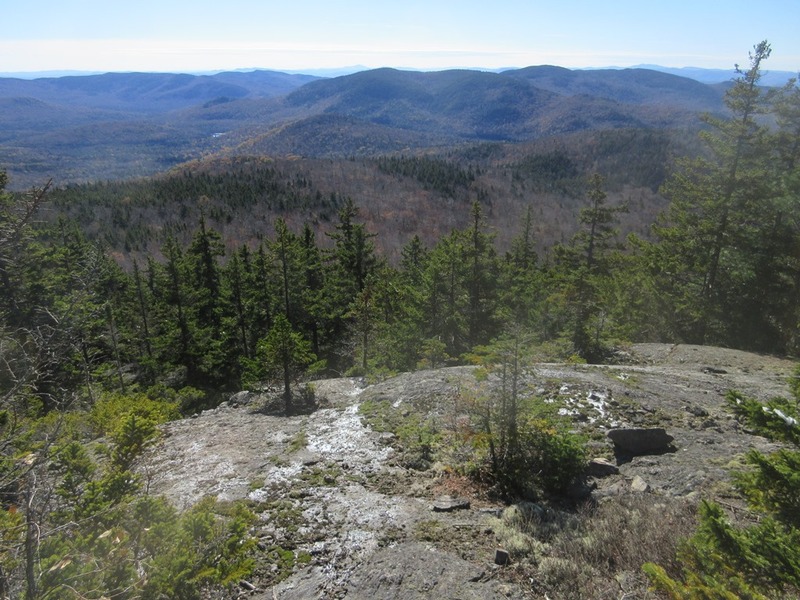 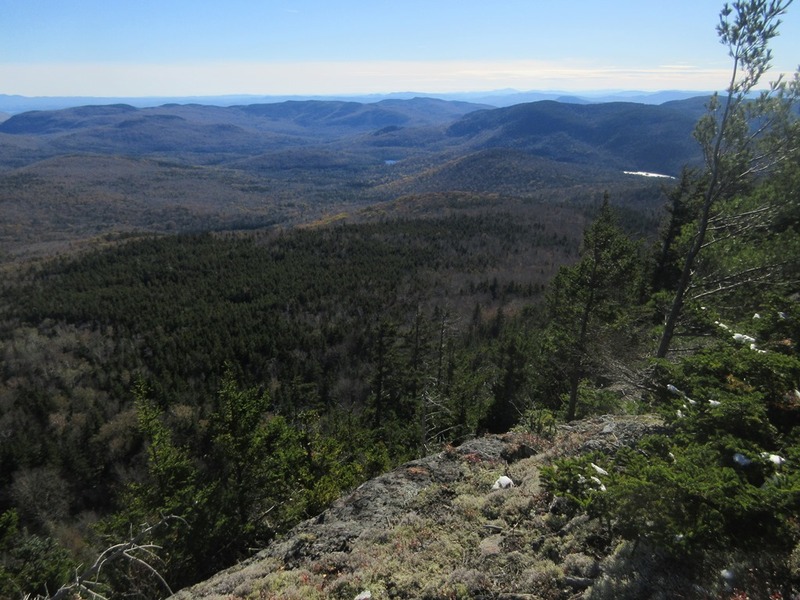 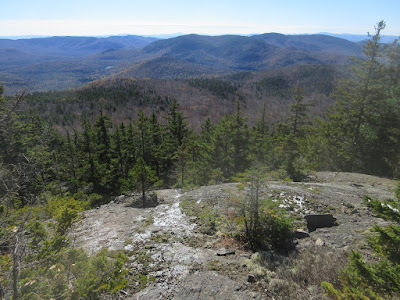 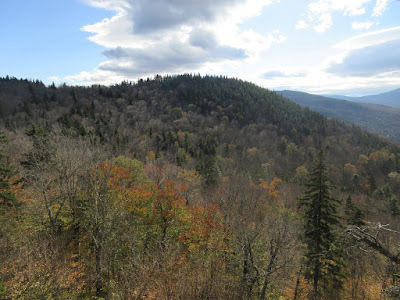 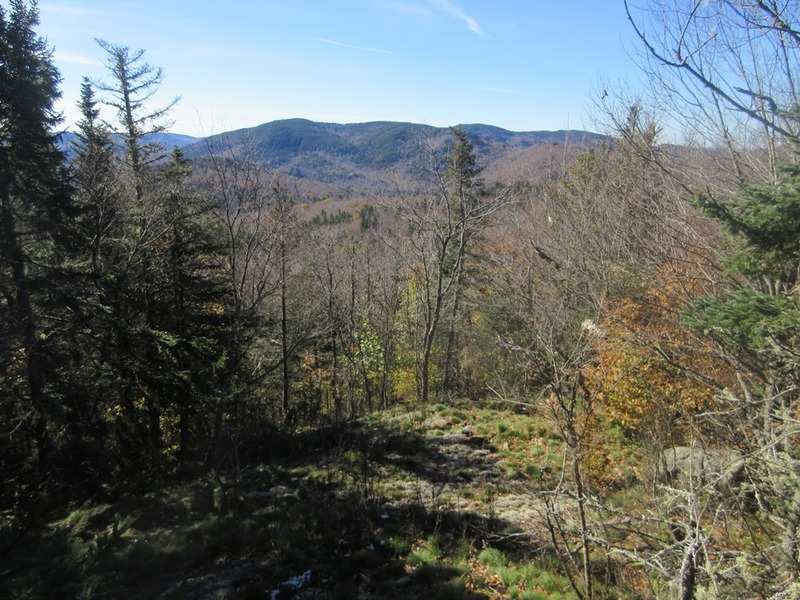 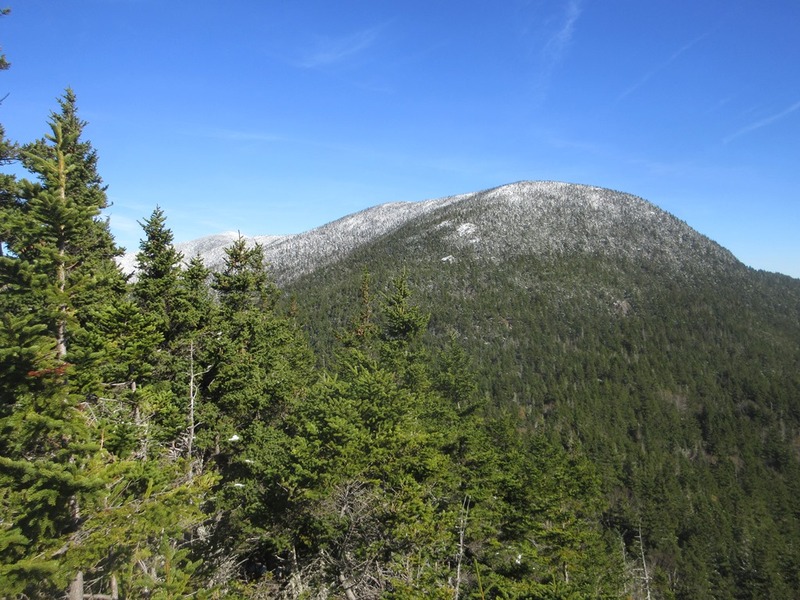 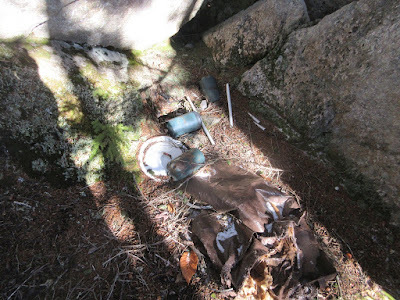 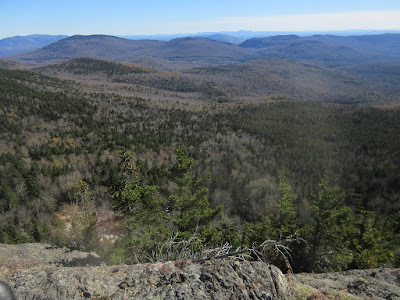 Mark Klim and I enjoyed a leisurely bushwhack from Sandwich Notch Road to the lower of the two Black Mountains on Sandwich Dome, with a loop descent via the Algonquin Trail. 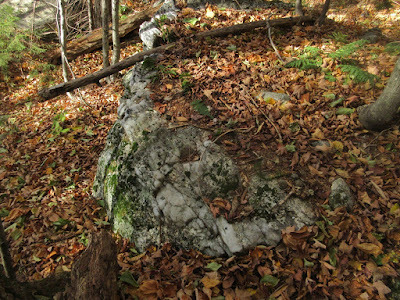 A fine variety of natural and historic features made for an interesting day. 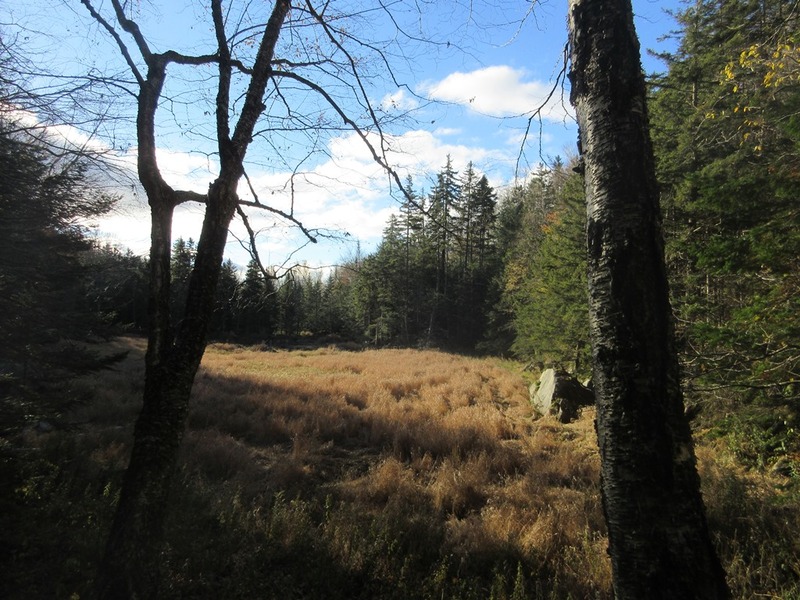 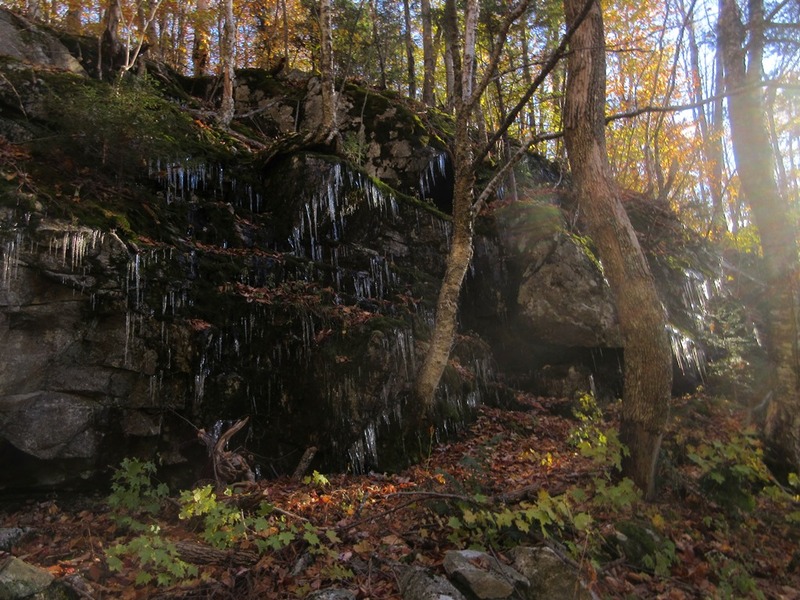 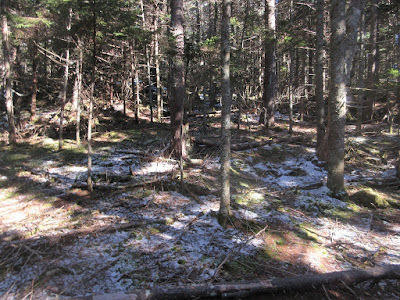 Our first destination was a beaver meadow below Sandwich Notch Road. When I came here in May the grass was a vivid green. 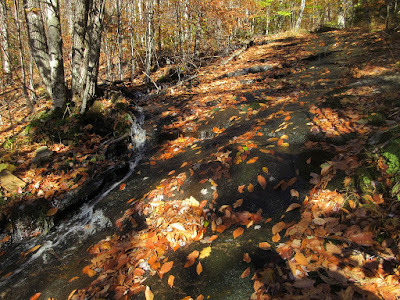 A high cascade on the brook that flows into the meadow. 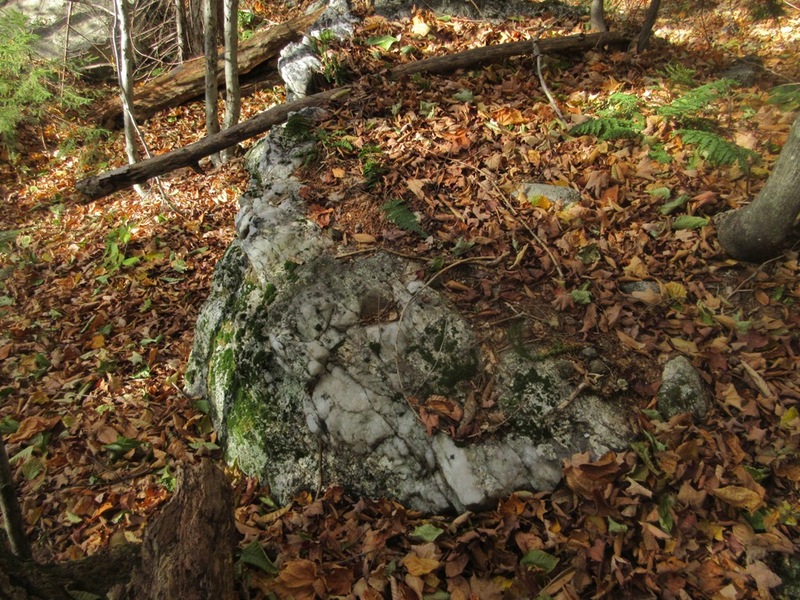 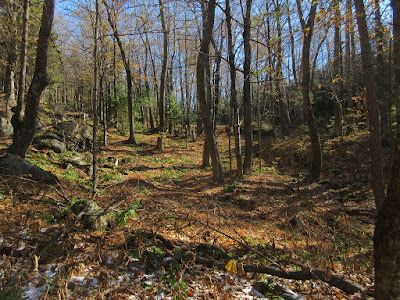 A leaf-strewn ledgy section of brookbed. 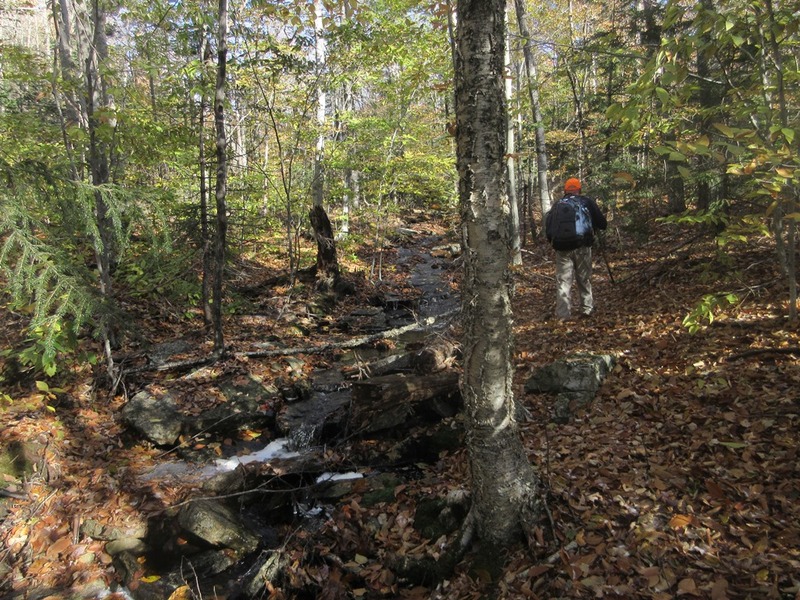 Whacking up along the brook. 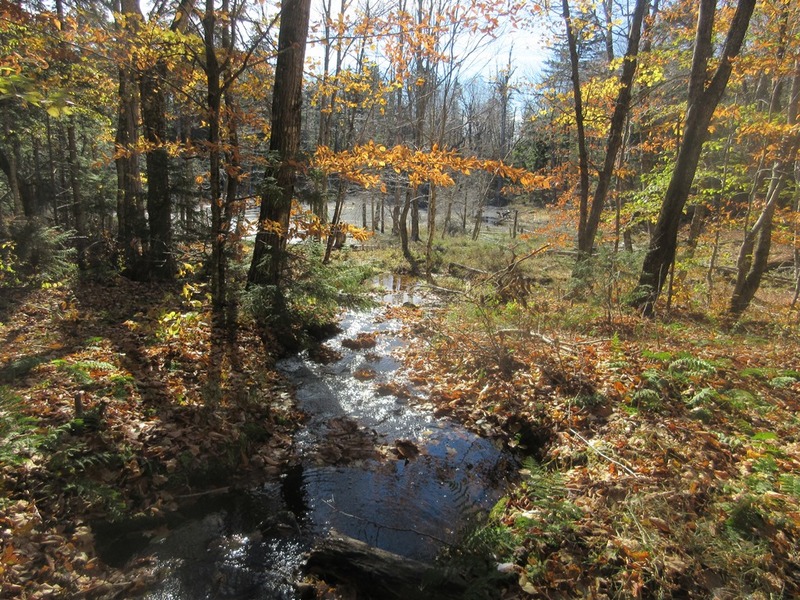 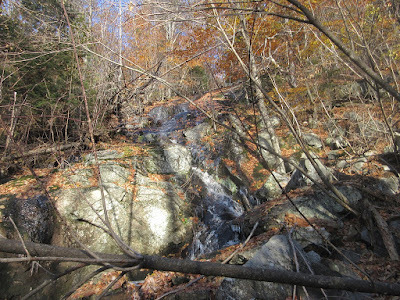 In the Catskills following a brook to its source is called "blue-lining." 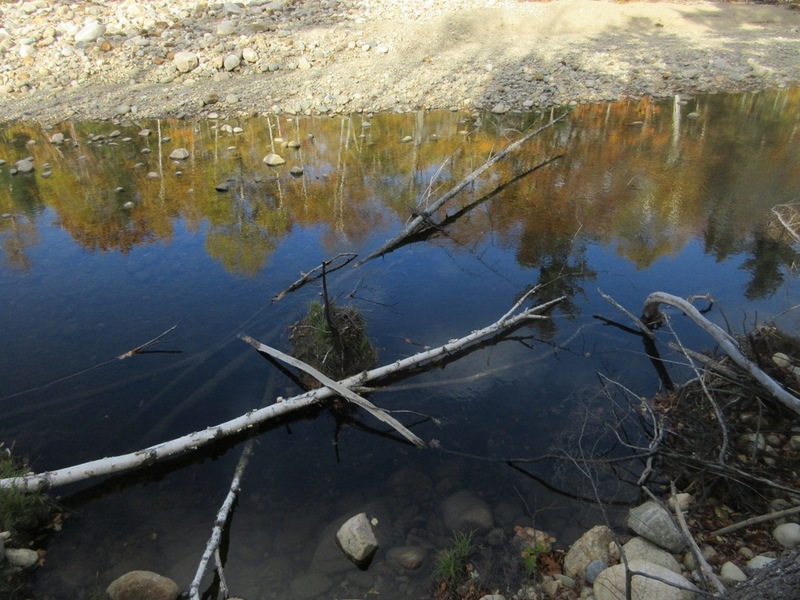 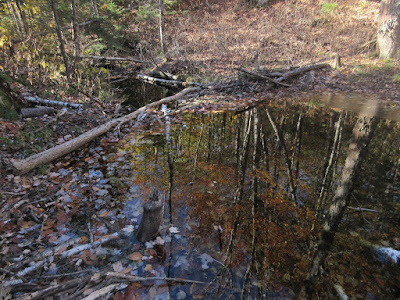 Reflections by a long-abandoned beaver dam. 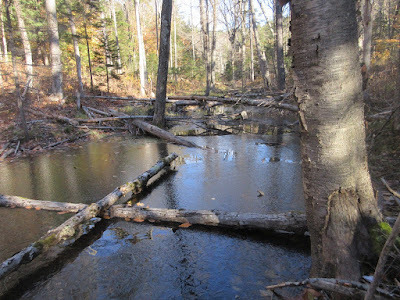 This section of the brook is still flooded. 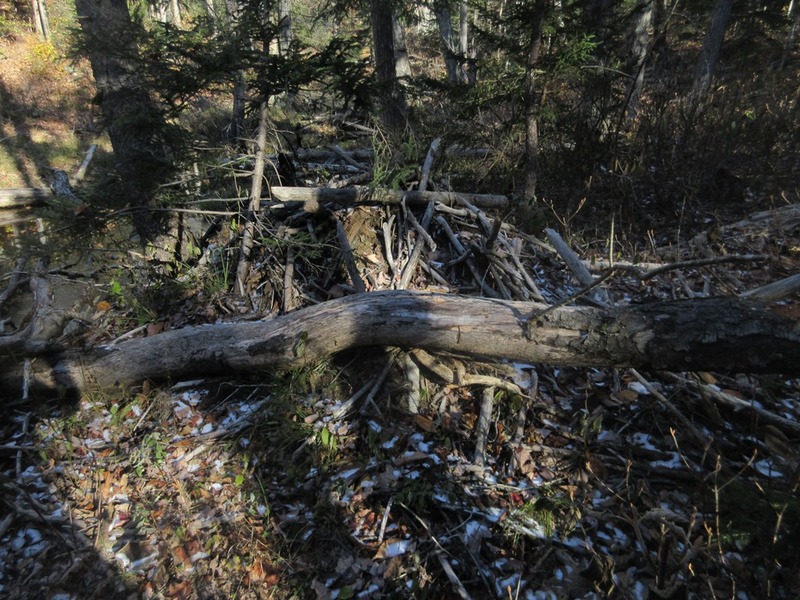 An old beaver lodge, now on dry land. 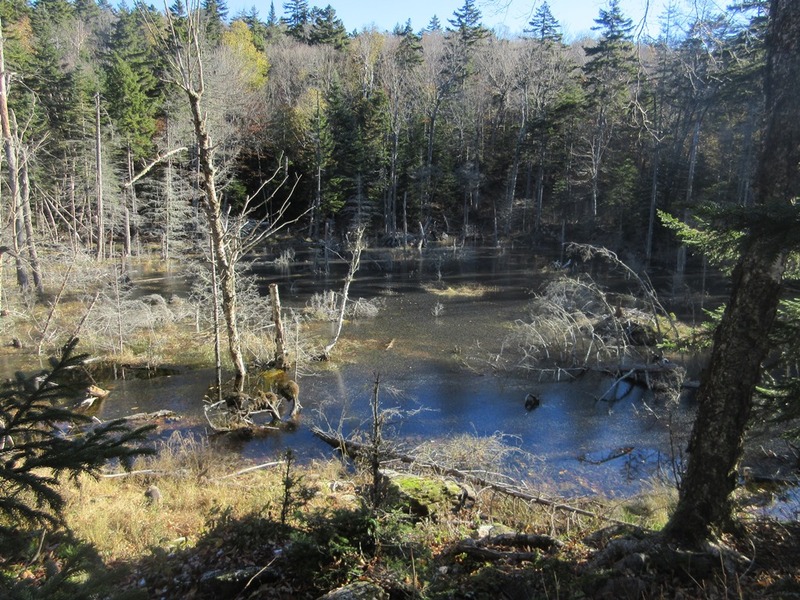 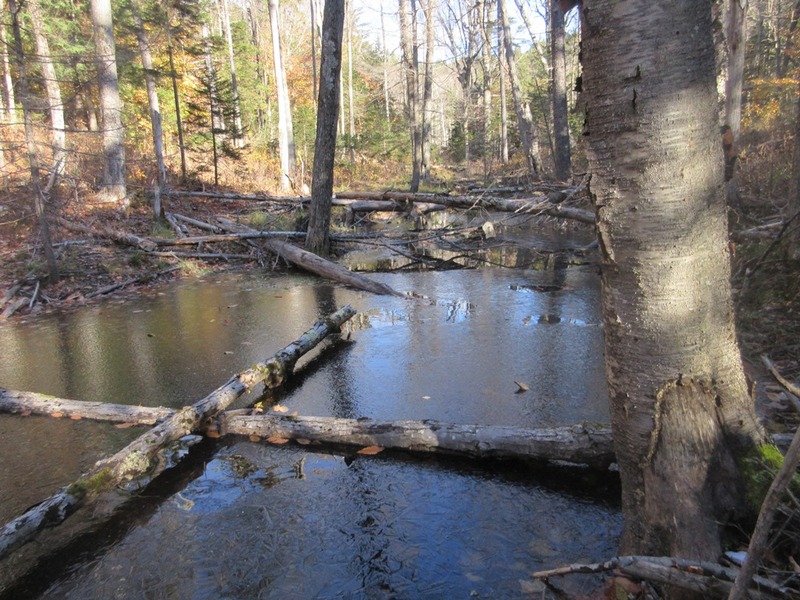 Just upstream is an old beaver pond. 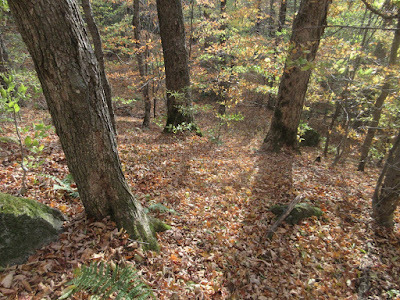 Beautiful hardwood glade beside the pond. 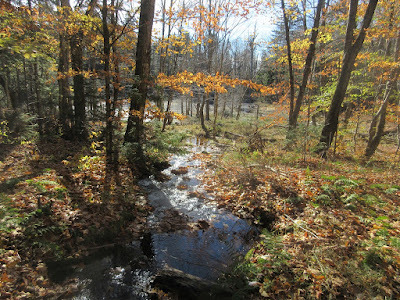 Looking back along the brook above the pond. 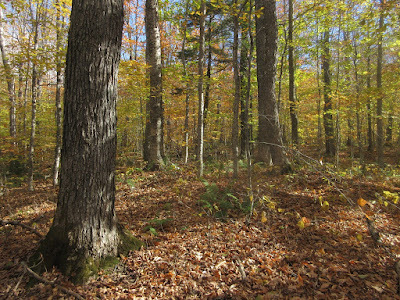 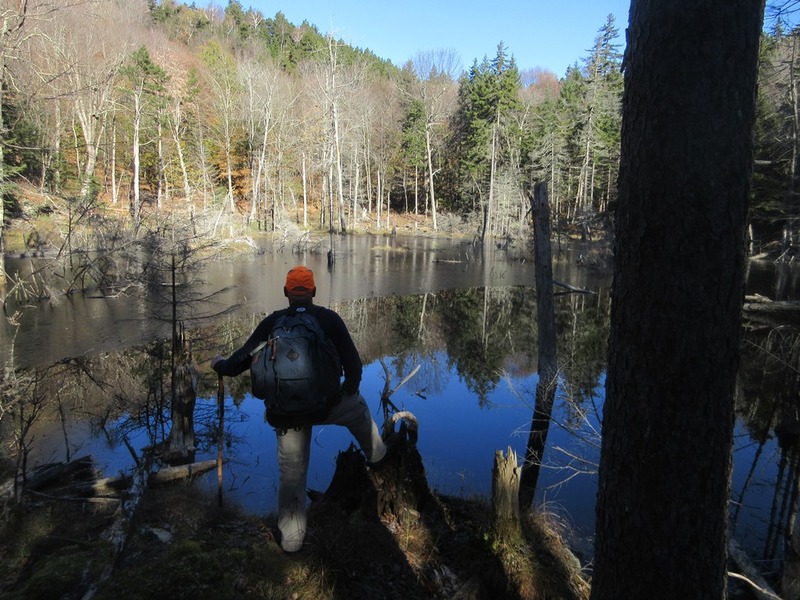 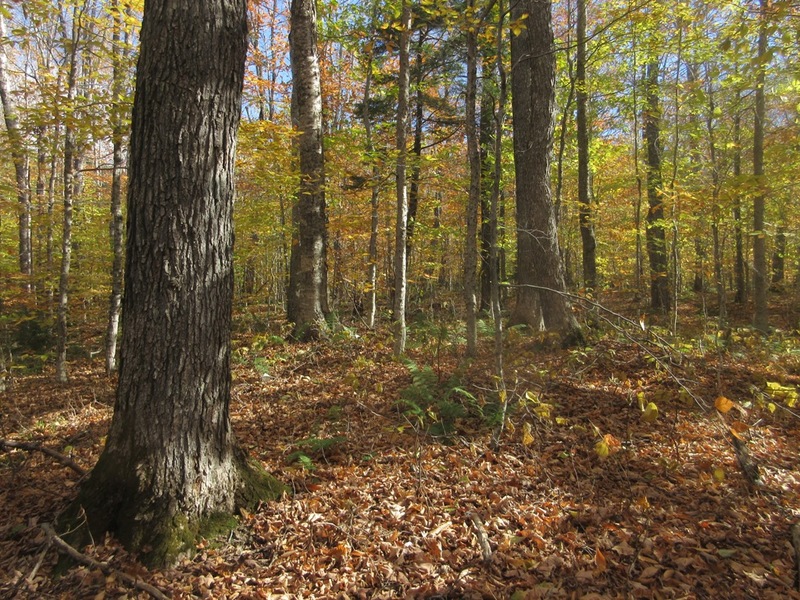 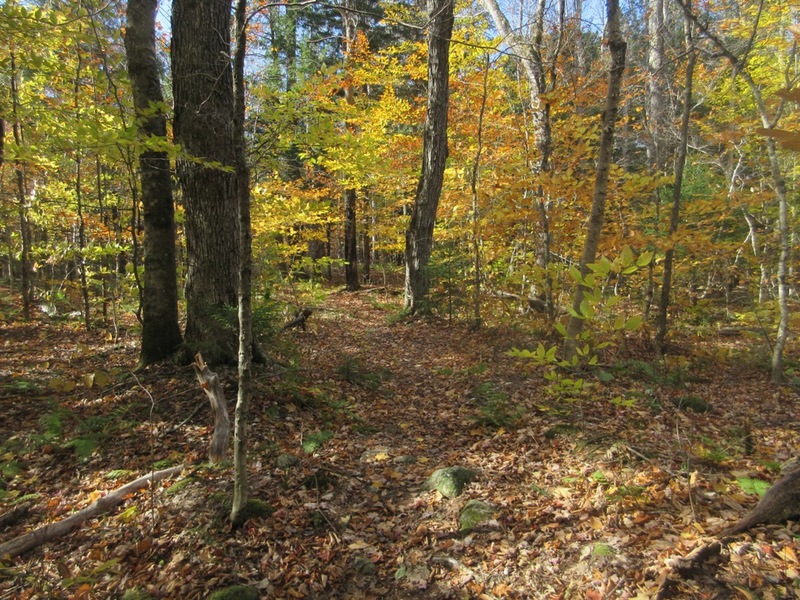 One of my favorite hardwood glades, near the source of the brook that feeds the beaver pond. 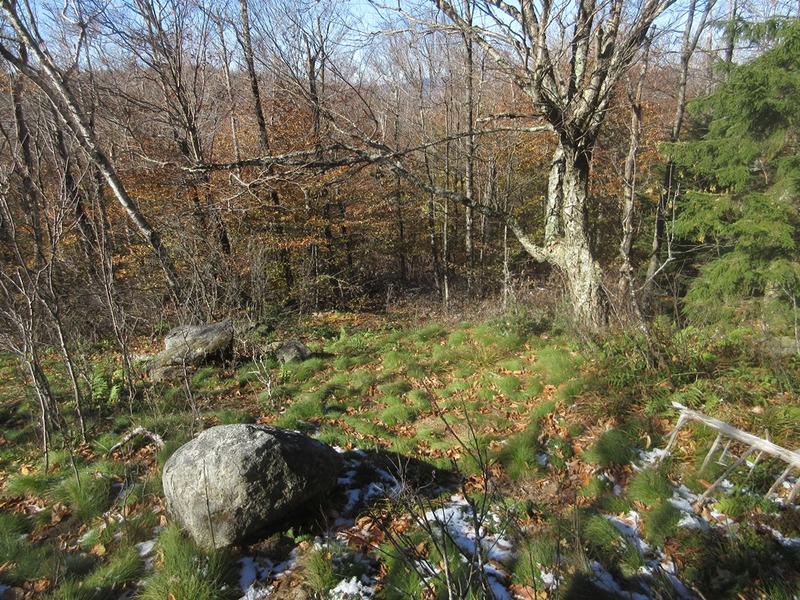 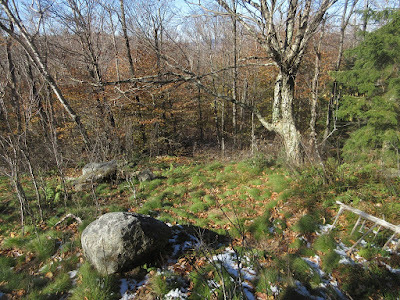 Grassy spot on the ridge above the glade, a southwestern spur of Black Mountain. 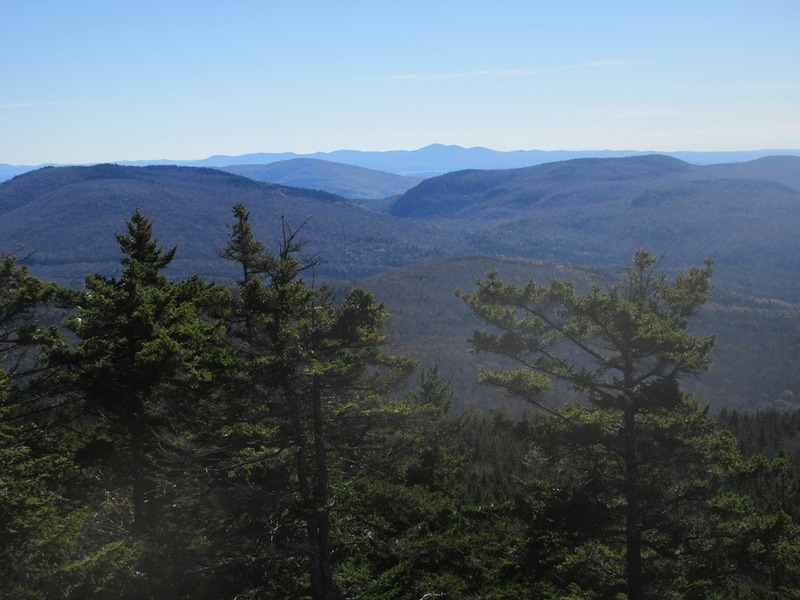 View of the Campton Range from another ridgetop meadow. 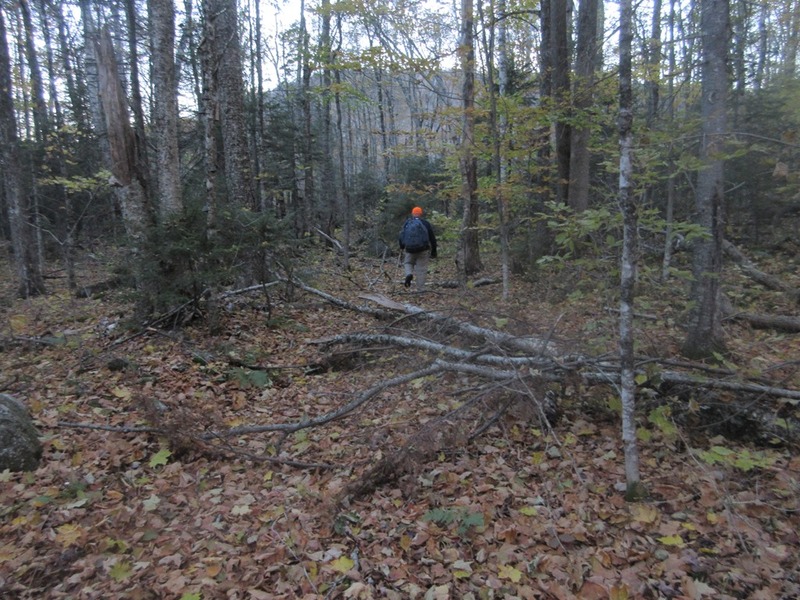 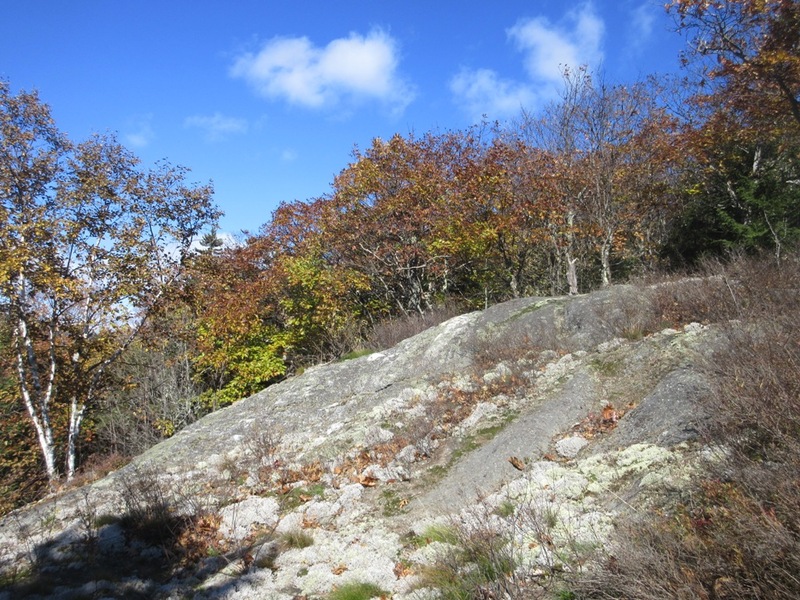 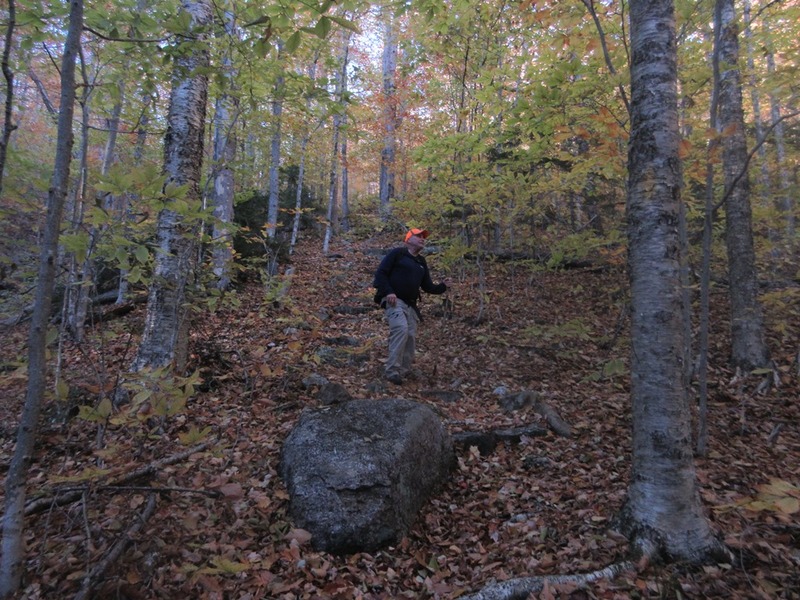 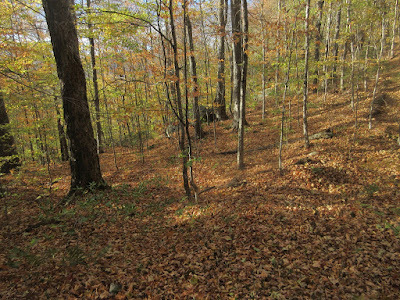 At 2400 ft. we reached the upper edge of the hardwoods on Black Mountain. 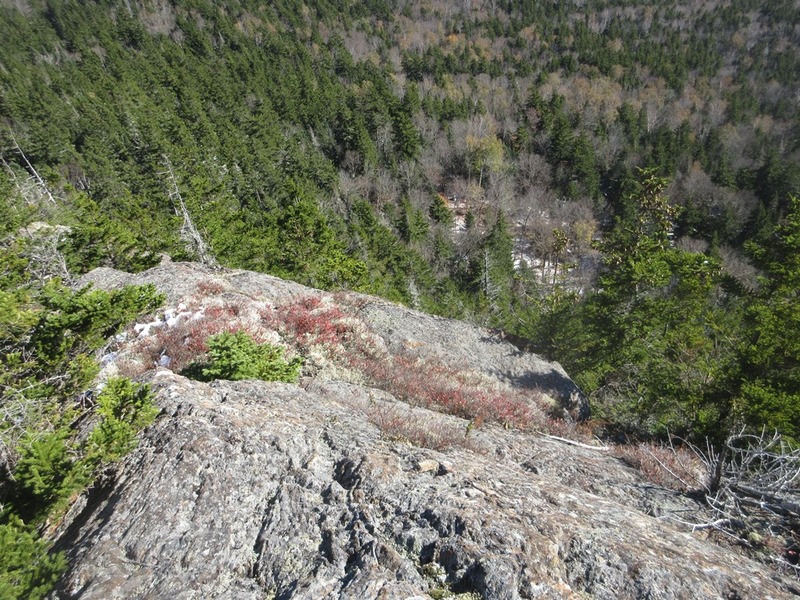 A steep climb through spruces lifted us to a spacious south-facing ledge I had first visited this spring. 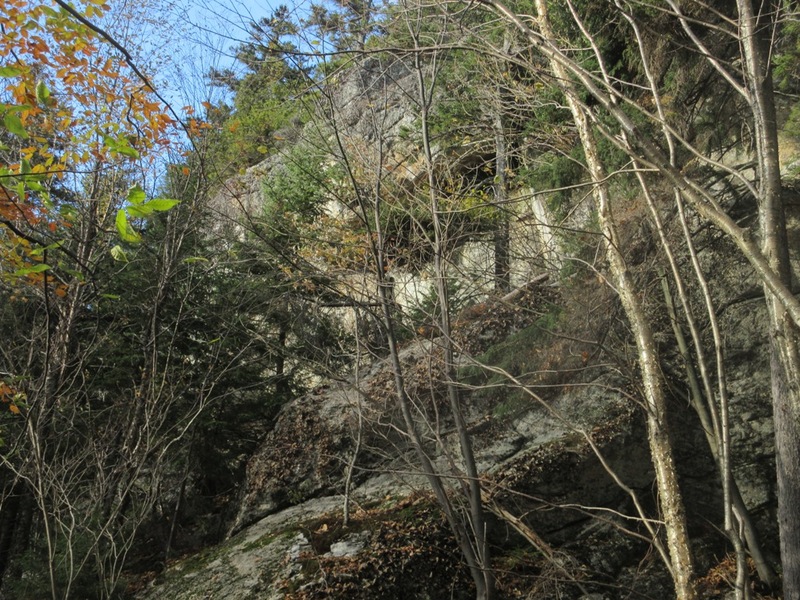 Red Hill and the Belknap Range seen through the eastern portal of Sandwich Notch. 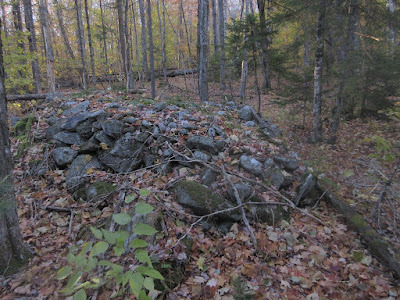 This long-abandoned campsite was a slightly creepy discovery in the woods up behind the ledge. An open stretch of spruce forest on the whack up to Black Mountain. 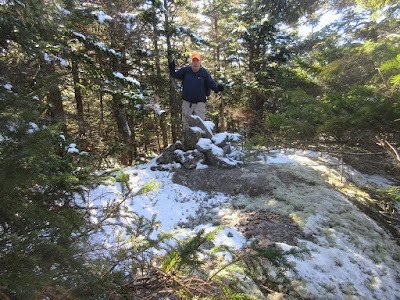 It wasn't all this cushy! 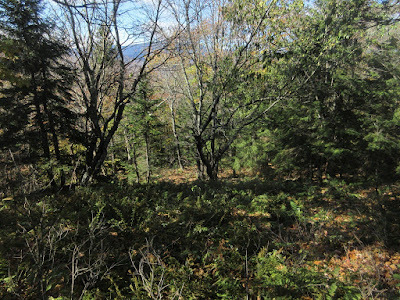 Out to a great view perch on the south side of the peak. 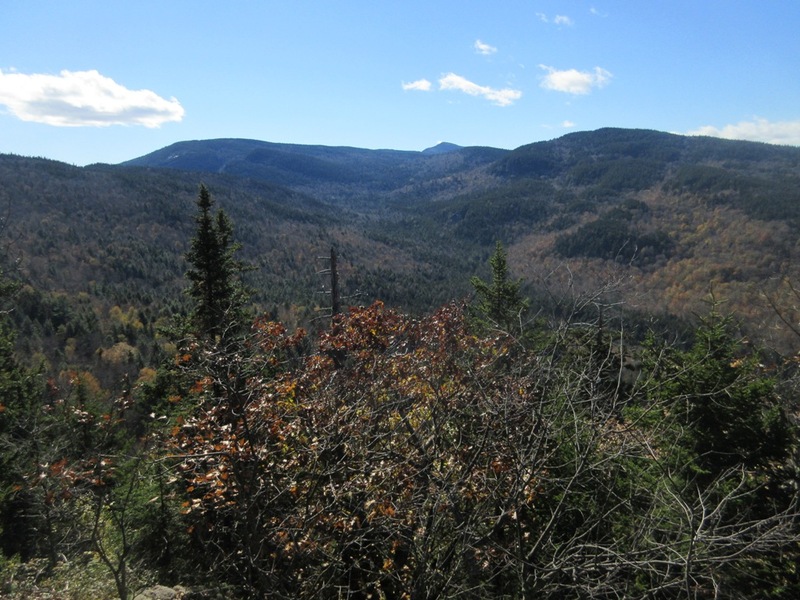 Looking across the SW corner of the Sandwich Range Wilderness to Mount Israel and Dinsmore Mountain. 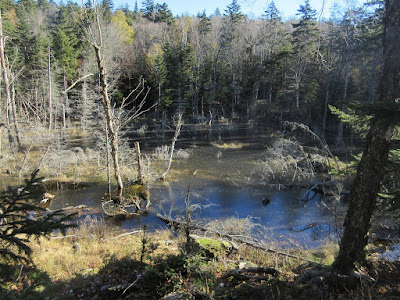 Glimpses of the Hall Ponds to the south. 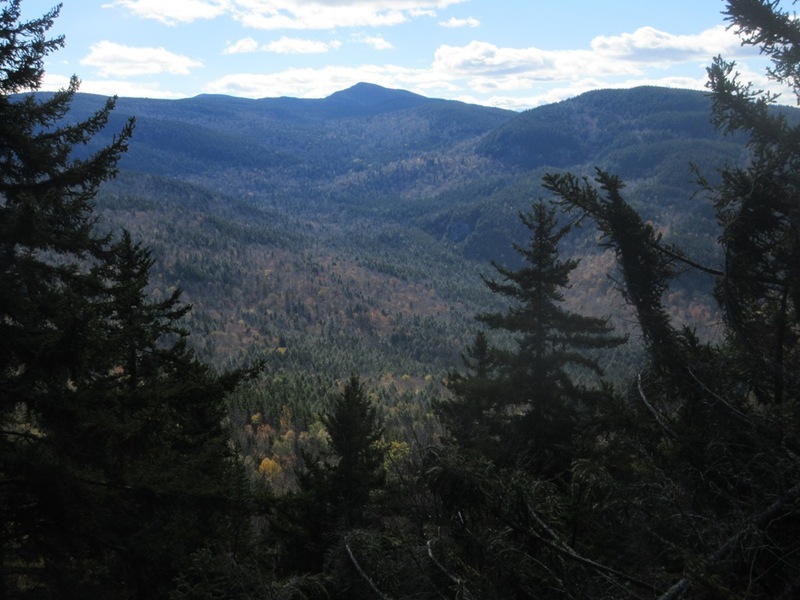 Peering up at the hulking mass of the higher Black Mountain (ascended by the Algonquin Trail), with the snowy summit of Sandwich Dome just visible on the left. 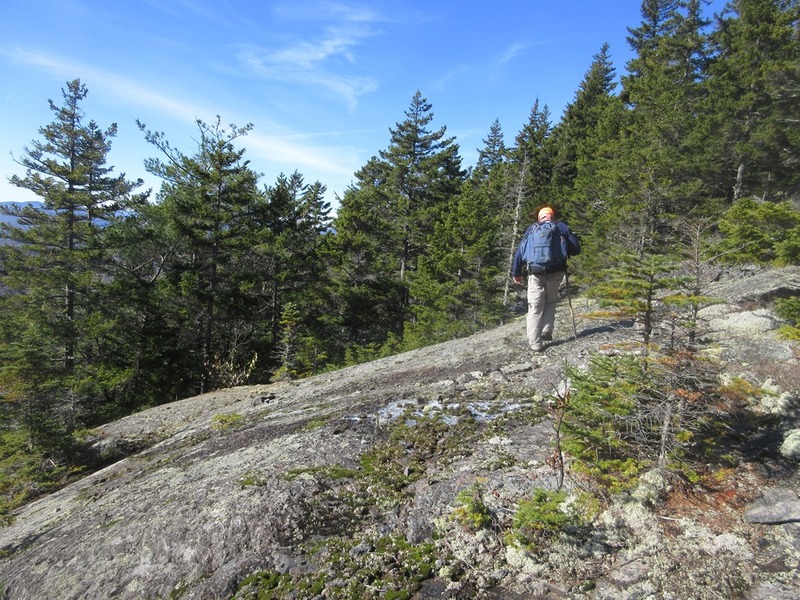 Mark takes in the views at the day's balmiest spot. 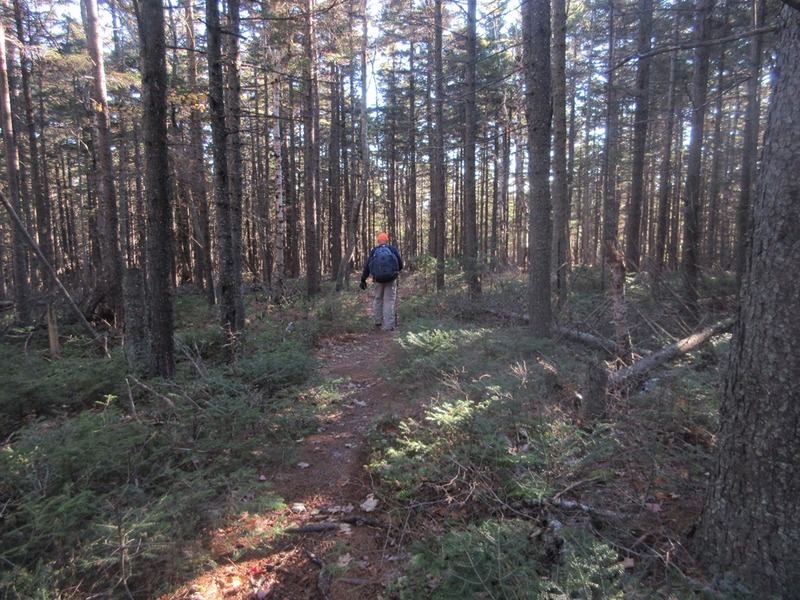 Nice spruce forest on the Algonquin Trail. 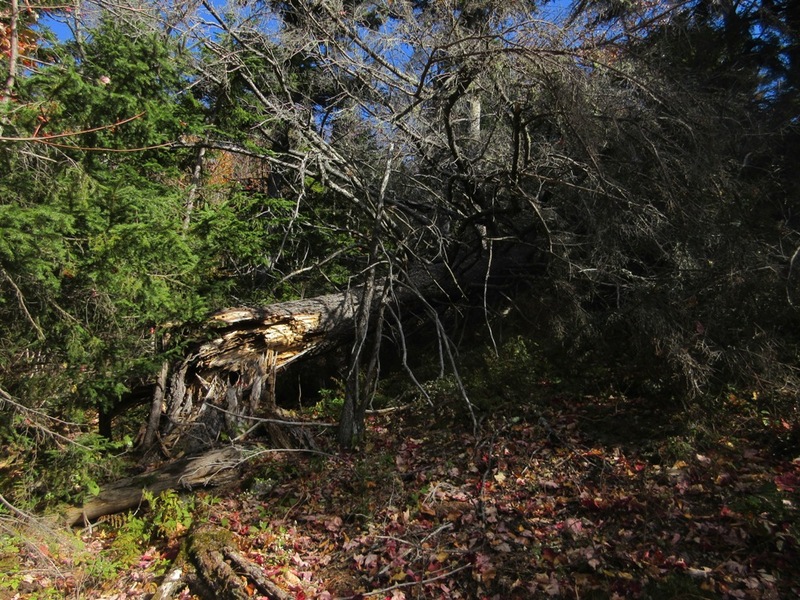 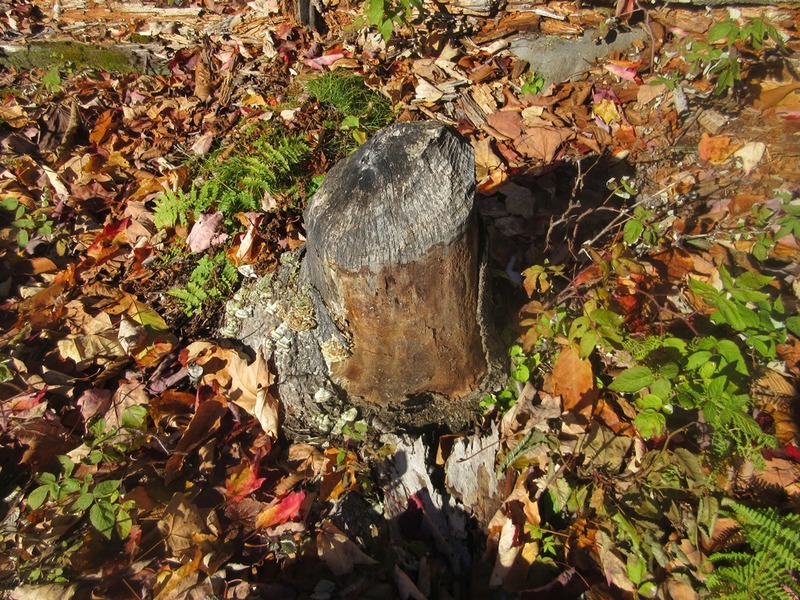 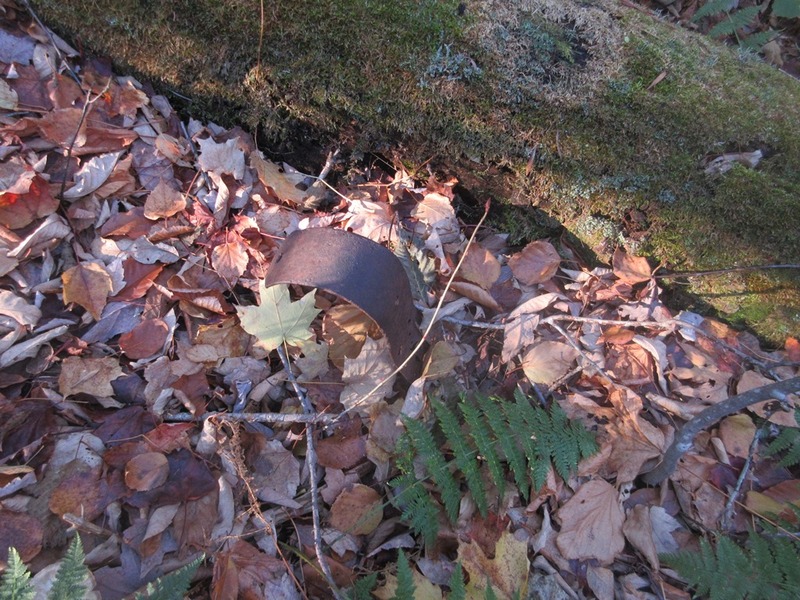 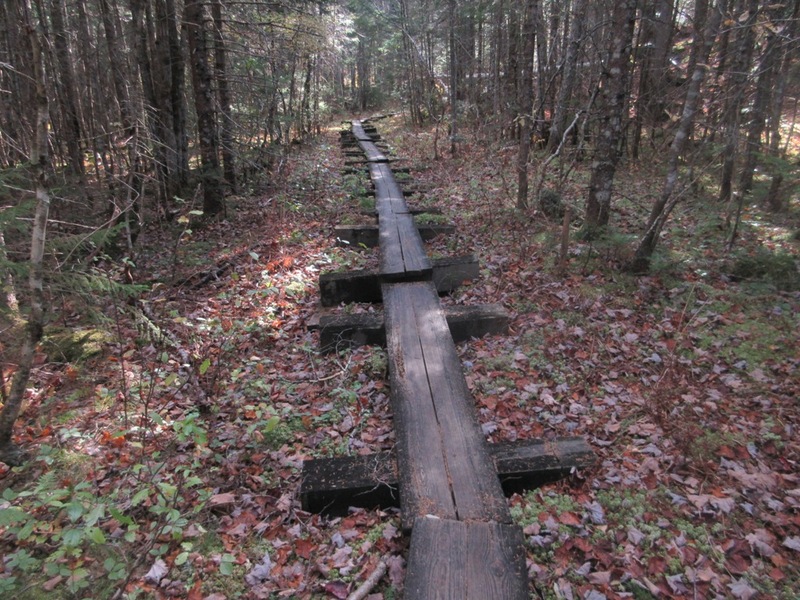 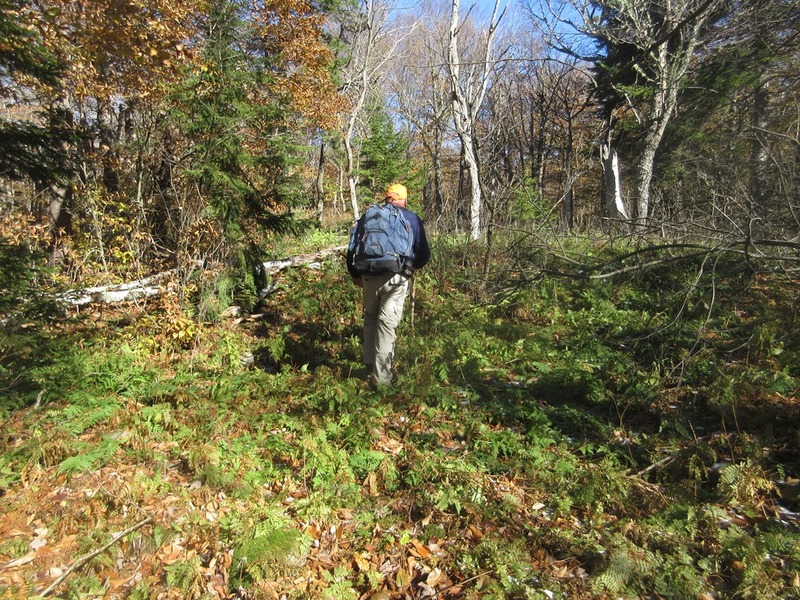 We spent a few minutes poking around an old logging camp site on the lower Algonquin Trail. 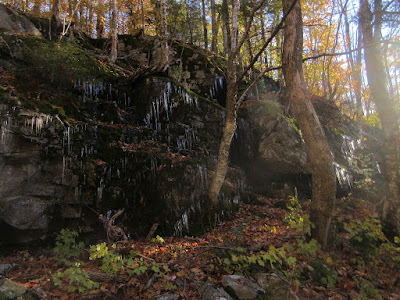 We followed part of the historic Old North Road on our way back to Sandwich Notch Road. This road was used as an alternate to the main road through the Notch by some of the hill farmers who lived in Sandwich Notch in the early 1800s. 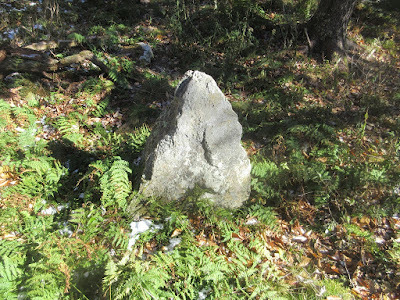 A great deal of information on the early history of Sandwich Notch is found in booklets published by the Sandwich Historical Society in 1935 and 1988. Evidence of this once-thriving hill farm community can be found above the old road, including this stone wall. 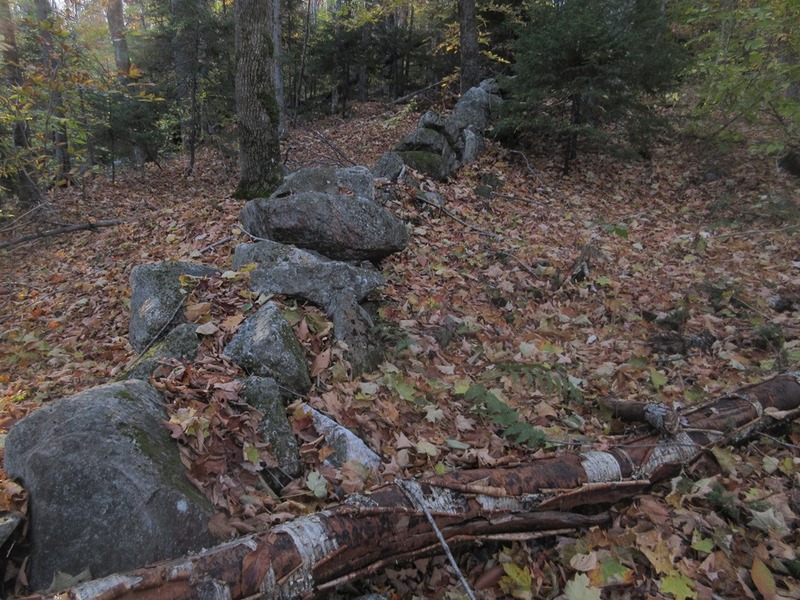 Stone piles suggest that this land was once cleared for pastures. This was apparently a barn foundation, perhaps associated with a farm owned by the Durgin family. 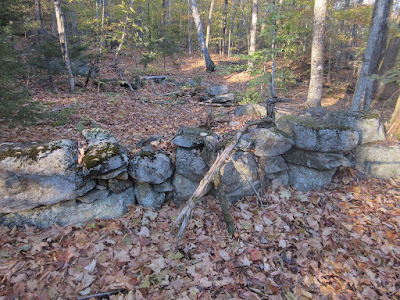 The main road through Sandwich Notch was built in 1803, and by 1830 more than 40 families lived in the area. The community in this harsh, rocky environment was short-lived, however, and by 1860, only eight families remained. 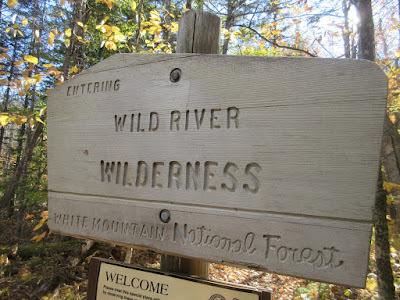 A bushwhack loop in the beautiful Wild River valley, visiting three viewspots on western spur ridges of West Royce Mountain. 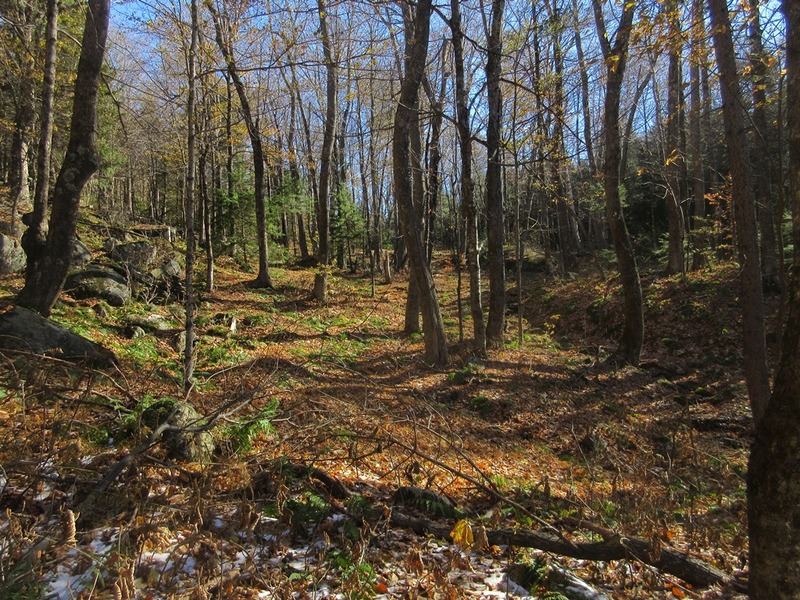 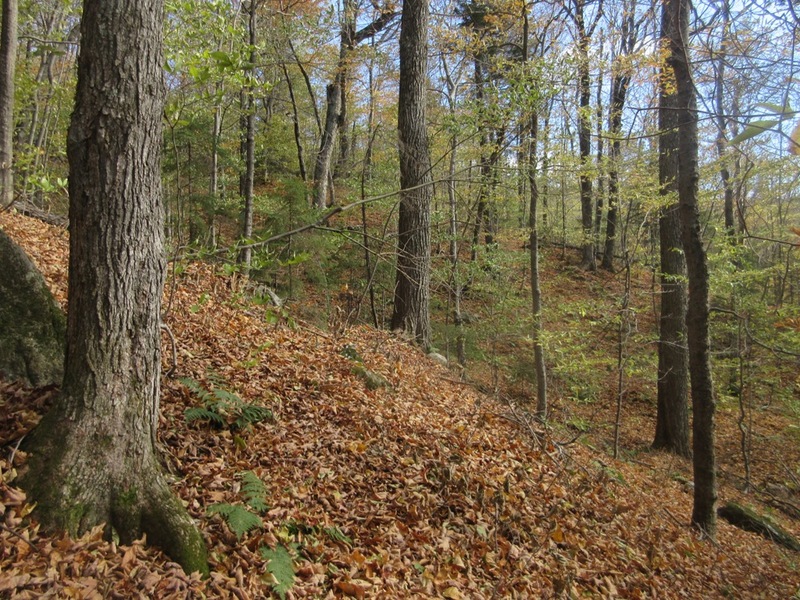 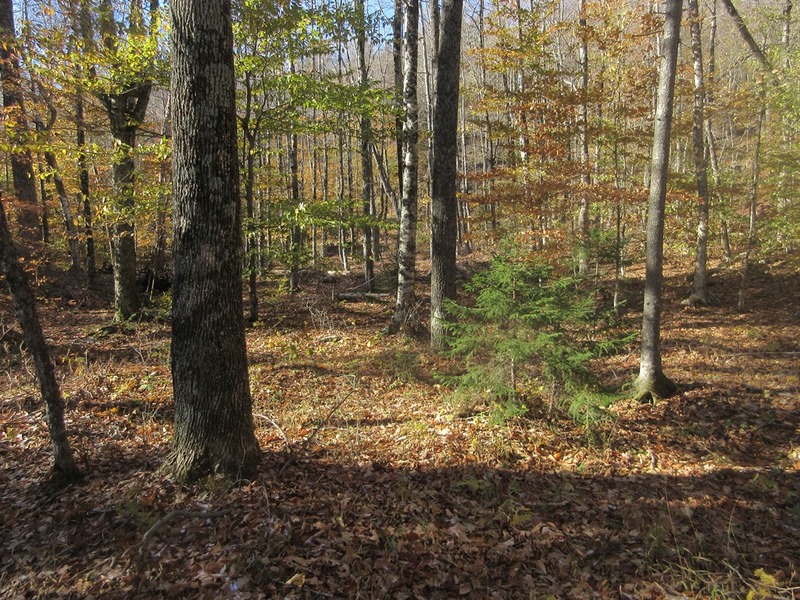 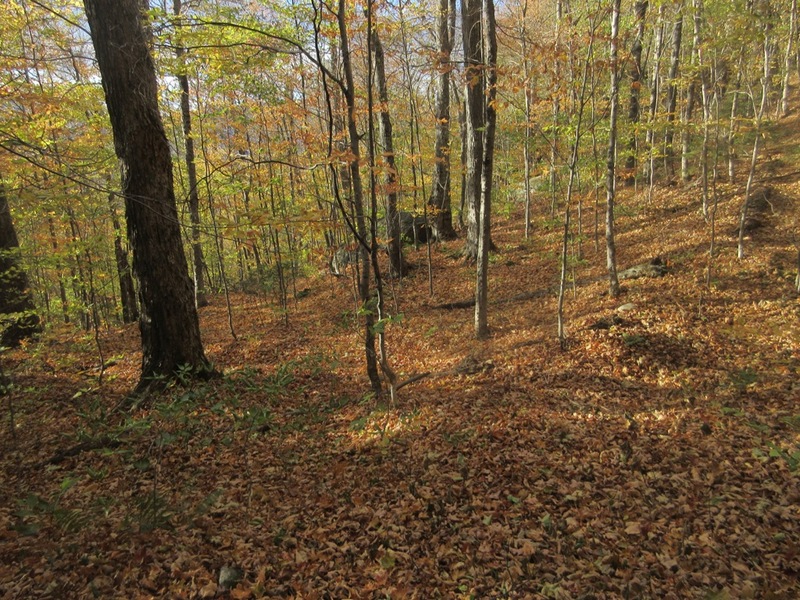 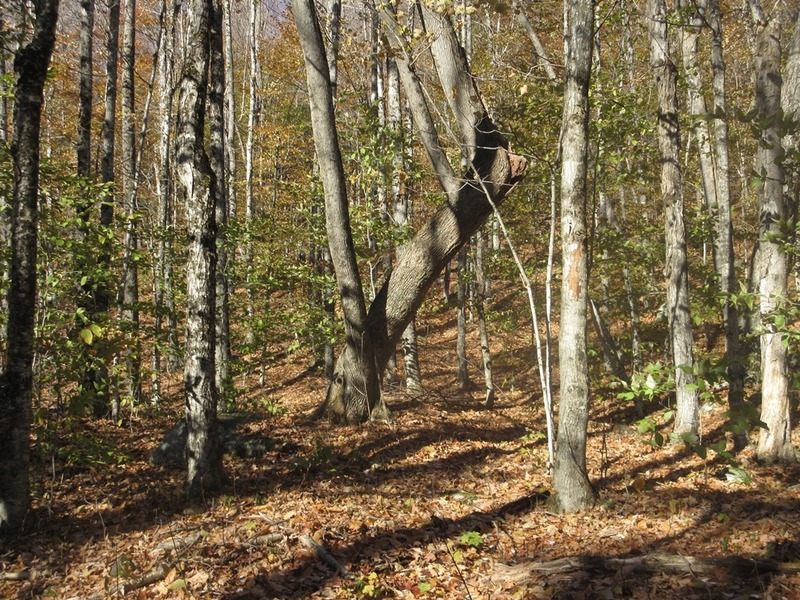 Acres and acres of fine hardwood forest and wide views over the valley to the Carter Range. 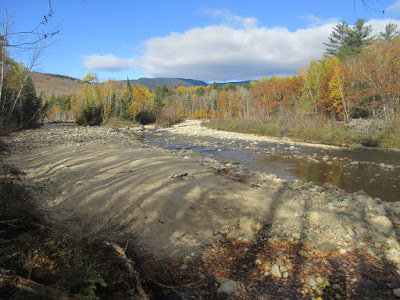 View across the Wild River to Mount Moriah, from a spot along the Wild River Road. 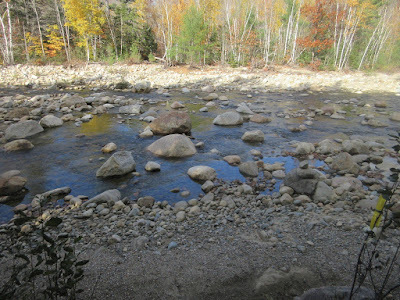 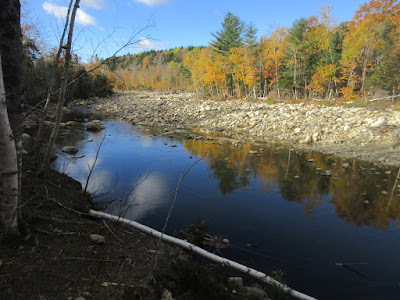 Checked out the river crossing on the Shelburne Trail, which was drastically rearranged by last year's Halloween storm. 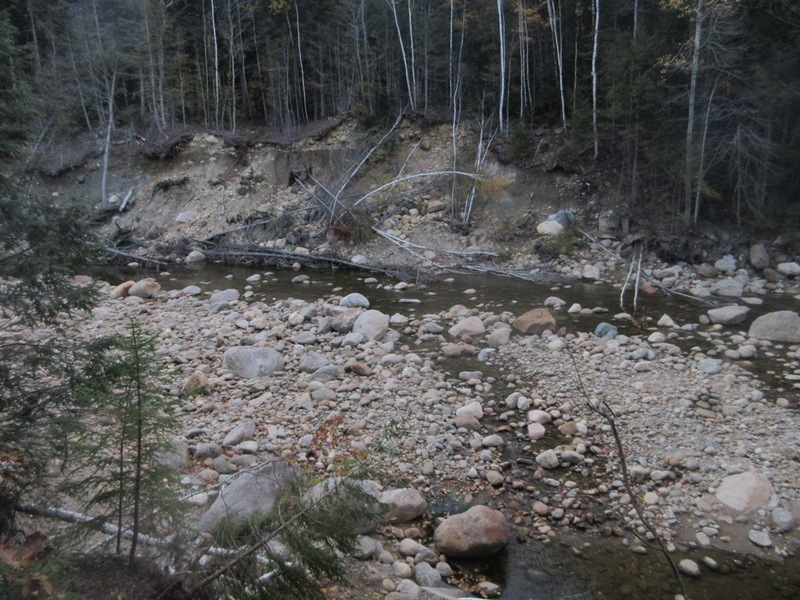 There's now a major dropoff at the site, and a deep pool below, where previously the crossing was shallow and rocky. A path has been flagged leading 0.1 mile north to a relocated crossing, at a spot where the river is rocky and shallower. As marked, the crossing leads diagonally back across the river towards the trail on the far side. 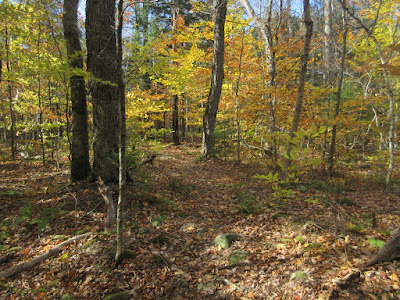 Sunny morning on the Basin Trail. 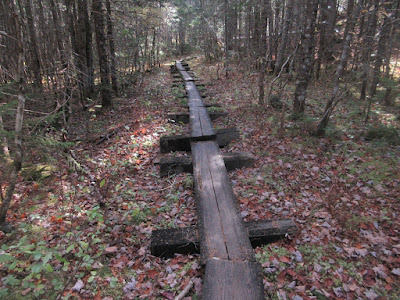 Long line of bog bridges. A wonderful place, though my bushwhack loop was just outside the Wilderness. Still, the western slopes of West Royce are retained in a primarily natural state as a roadless area. 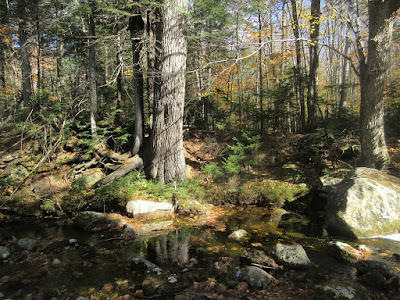 Big trees on the bank of Blue Brook. 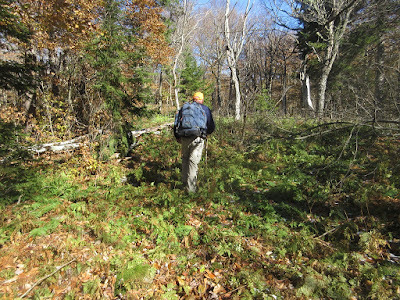 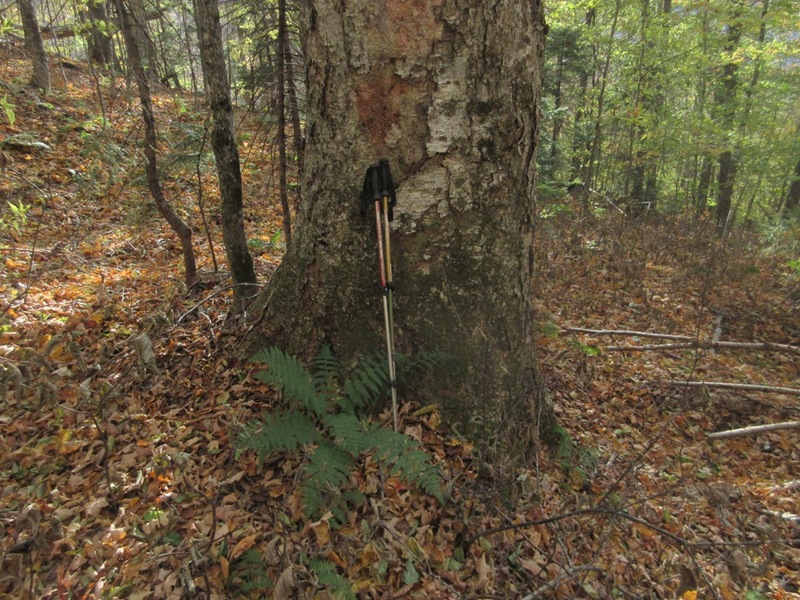 Hardwood whacking was the order of the day as I headed up a tributary drainage of Blue Brook. 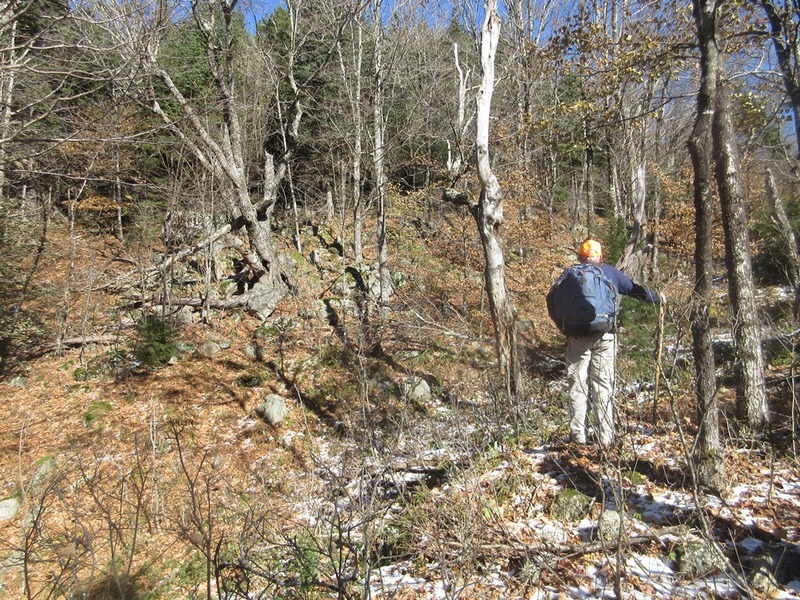 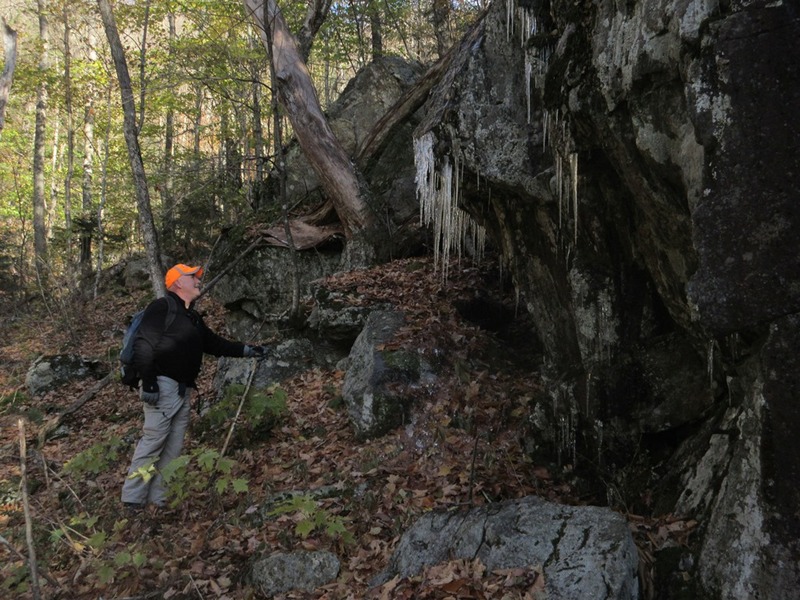 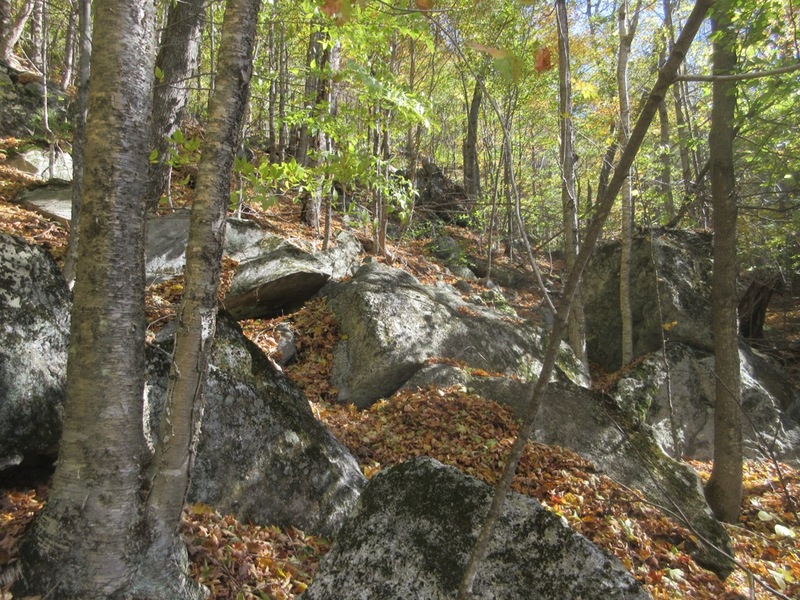 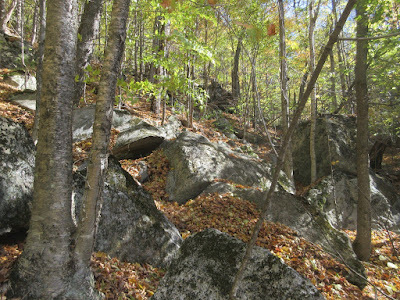 Bouldery terrain marked the beginning of a very steep climb up to a ridge with view ledges. Atop the somehwat scrubby ridge. 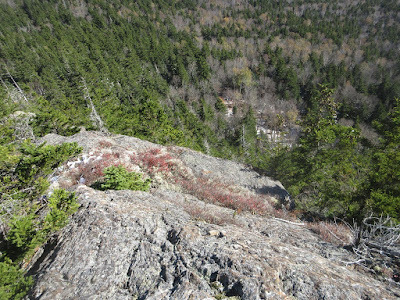 Arrived at the major view ledge in time for lunch. 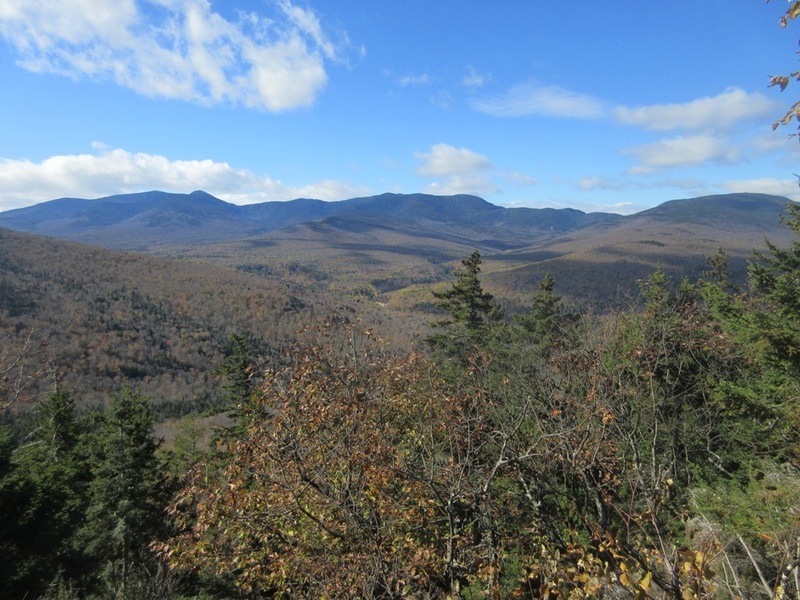 I stayed a while to enjoy the expansive vista westward across the Wild River Wilderness to the Carter Range. 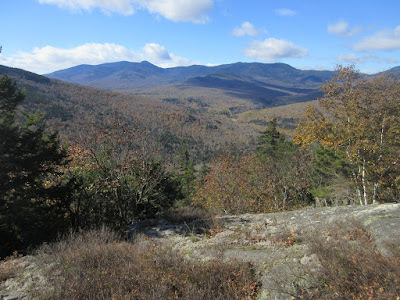 Rainbow Ridge, Carter Dome and Mt. 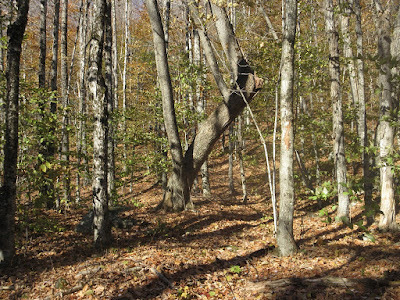 Hight. Looking up the Moriah Brook valley to Middle & North Carter and Imp Mountain. 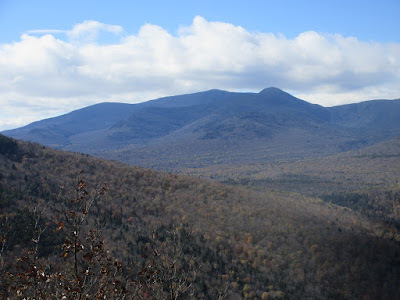 Close by to the south are Mt. Meader and "Blue Brook Mountain," with North Baldface peeking over in back. Adding Mt. Moriah to the Wild River view. Heading up the ridge, one of the biggest spruce blowdowns I've seen. 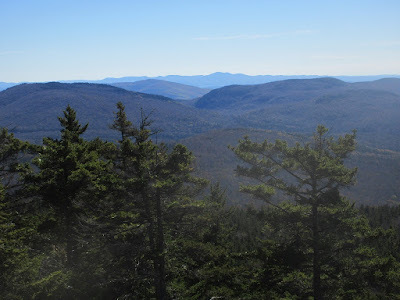 From another ledge, North Baldface seen beyond the Blue Brook valley. 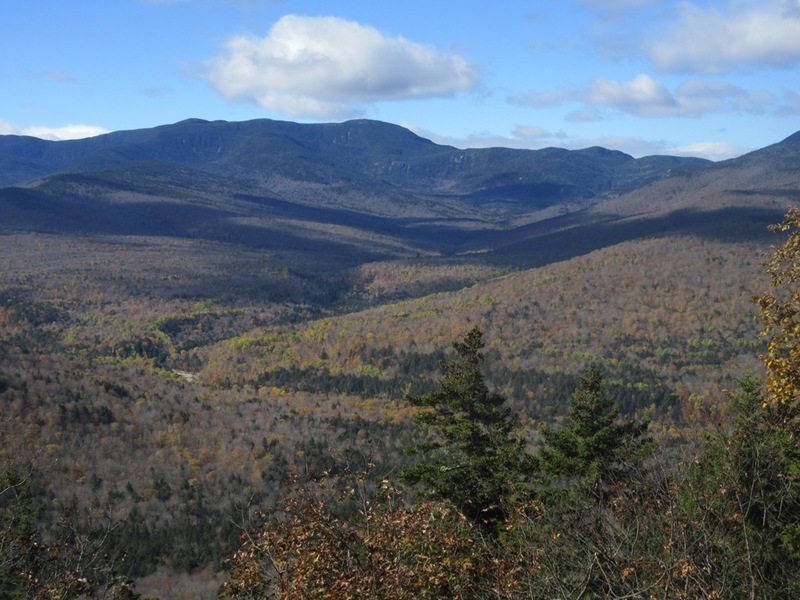 South Baldface peeks over on the left. 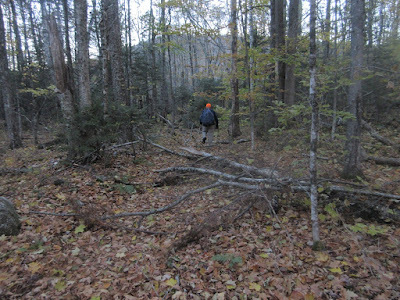 I headed north across another drainage to the next ridge, ascending through fine mature hardwoods. 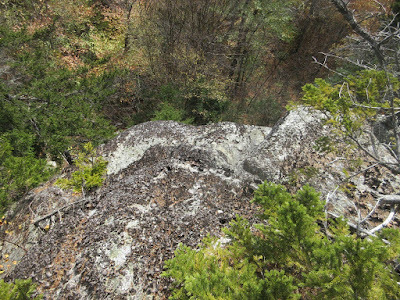 I worked my way up, around and down to the top of a cliff spotted through the trees. 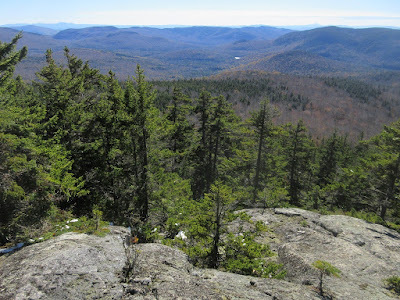 Looking back to the ridge from whence I came. 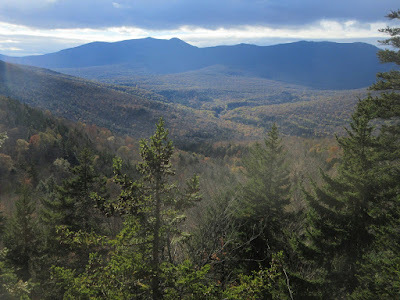 Another nice view of the valley and the Carters. 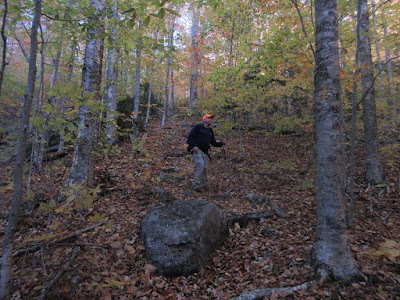 Descending through a maple gateway. 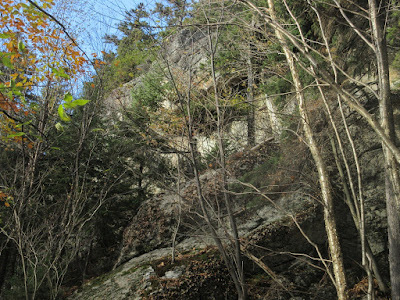 Looking back up at the cliff. 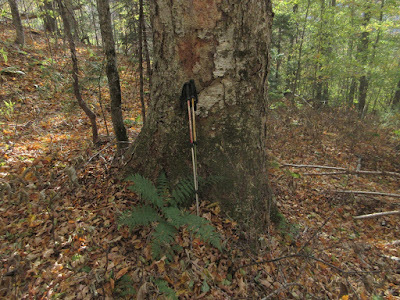 October hardwood whacking is the best. 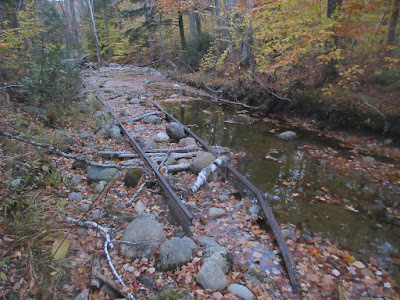 After returning to the trails, I headed upstream a little way on the Wild River Trail to have a look at the current state of the Moriah Brook Trail crossing of the Wild River, where the USFS removed a bridge in 2016. The crossing, reached by a short trail relocation, is decidedly sketchy, as one must drop over a steep, unstable bank before wading across the river. 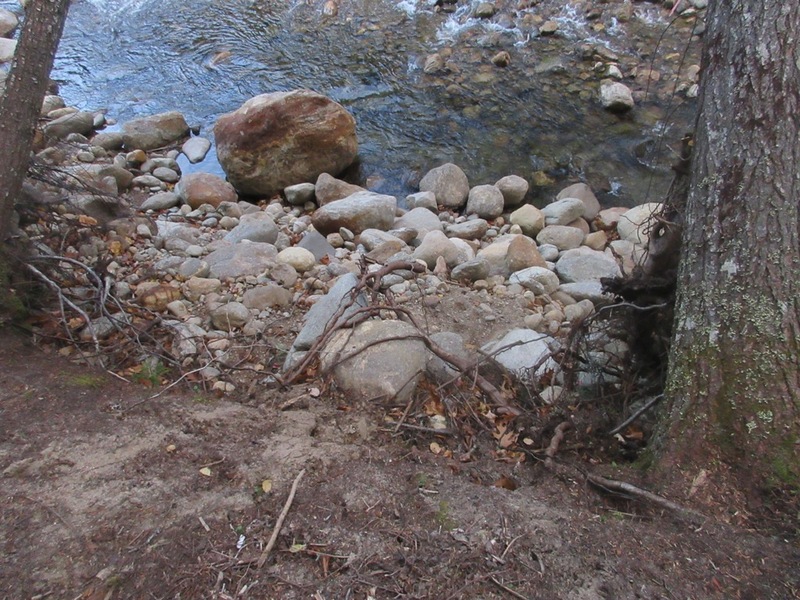 Impressive bank erosion seen across from the former bridge site. 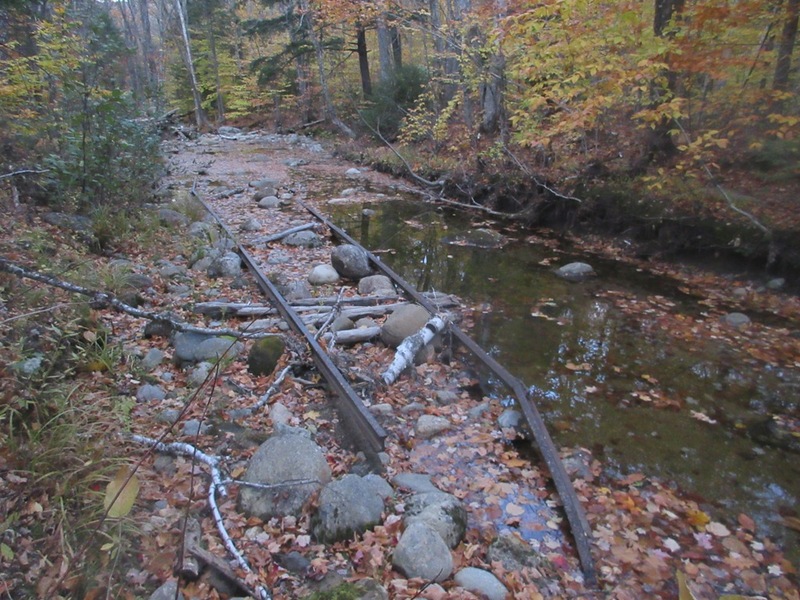 Before heading back, I revisited a section of railroad track left over from the Wild River Railroad, a logging line that operated in the valley from 1891-1904. 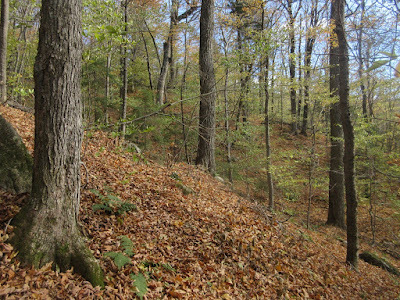 A photo of this track was featured on the cover of Nature and Renewal, by Dean B. Bennett, a fascinating book on the human and natural history of the Wild River Valley.